I love this time of year when raptors are active and fairly easy to find in the neighborhood. The leaves are off the trees, enabling birds to be quickly spotted, but they can also be found by listening for their calls. 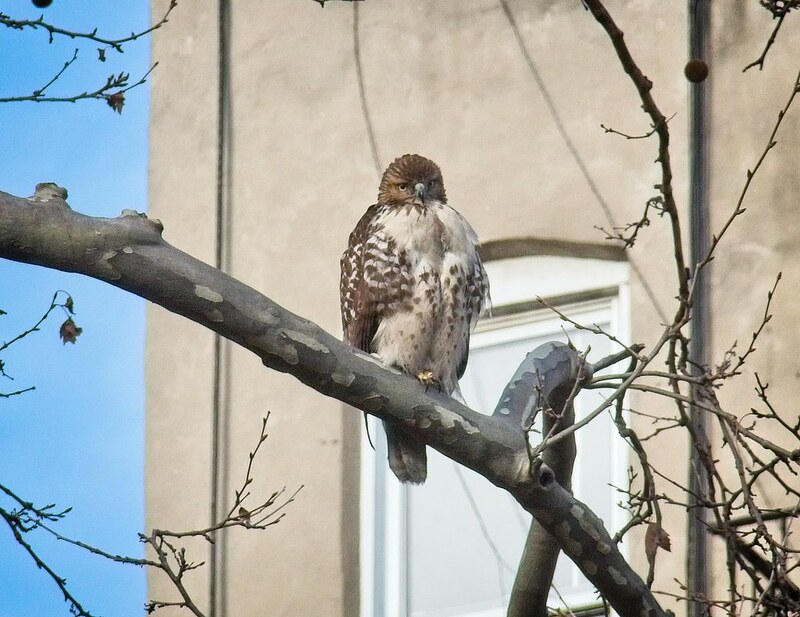 One recent afternoon, I was walking along busy Houston Street when I heard the loud calls of a Cooper's hawk. I followed the sound to a tree where I found an adult Cooper's perched and sounding off to an immature Cooper's who was in another tree across the street. In the video below, you can hear the calls of the immature hawk who is out of frame, and the answering calls made by this adult. In this video, the adult Cooper's fluffs up its feathers, dramatically changing its shape to look bigger. I don't know what was prompting this behavior. 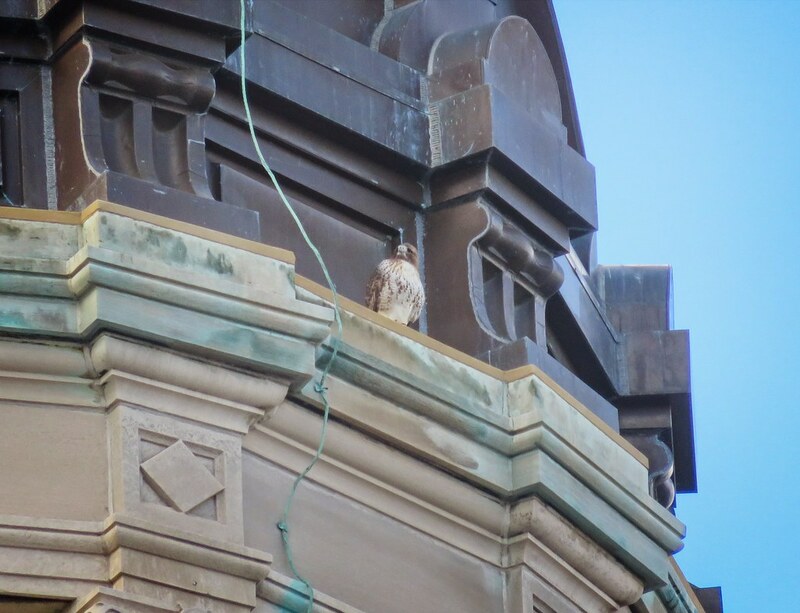 At the time, there was a Peregrine falcon perched a block away on the cross of Most Holy Redeemer church, but from their positions, it didn't seem like the hawks were reacting to its presence. It was fascinating to watch nonetheless. 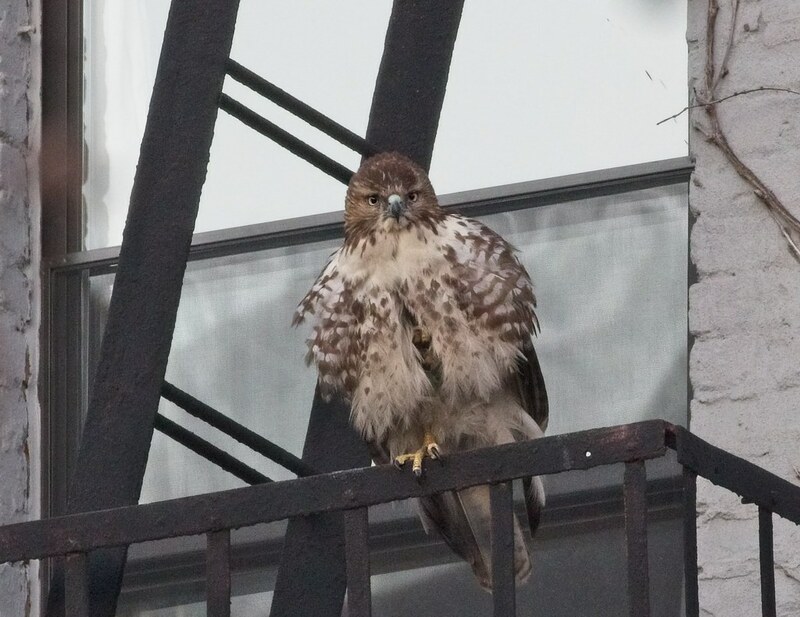 On a different day, I came across a young red-tailed hawk perched on a fire escape on 2nd Avenue. 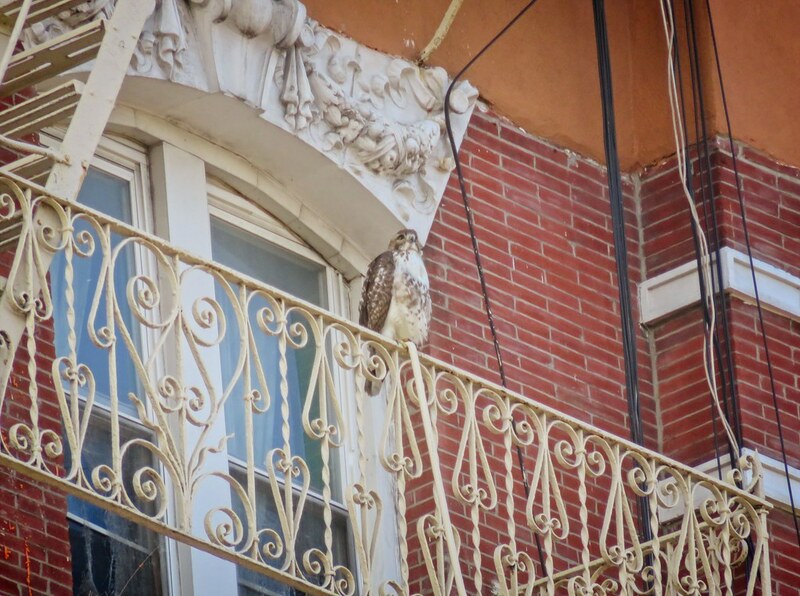 I first saw it pulling pieces off a dead pigeon that was hanging from a cornice, then it flew across the street to this building and dug around in a window box before perching on the railing. 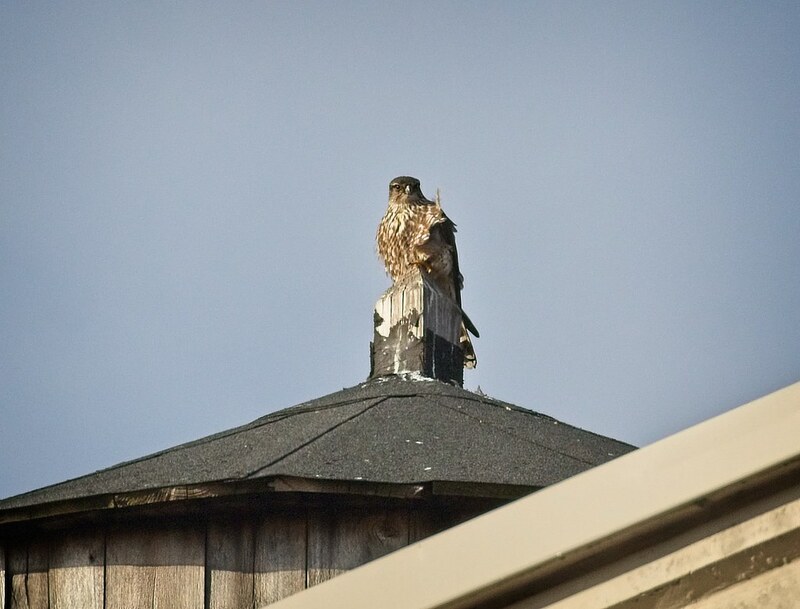 A second immature red-tail (I'm not sure how many are around at this time) has been seen in the area. It has a very stern expression, as you can see from the photos below. 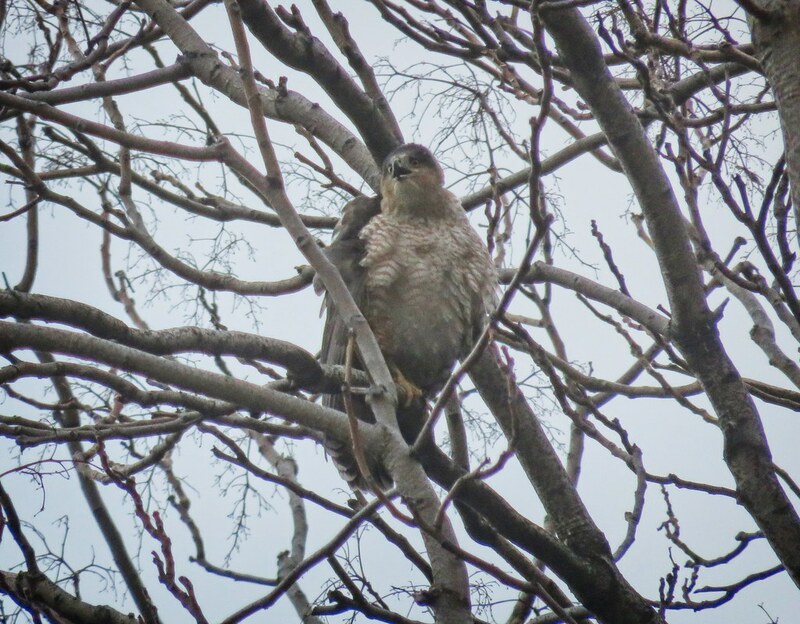 By contrast, the hawk in the above photo and video has facial markings that give it more of a baby face. 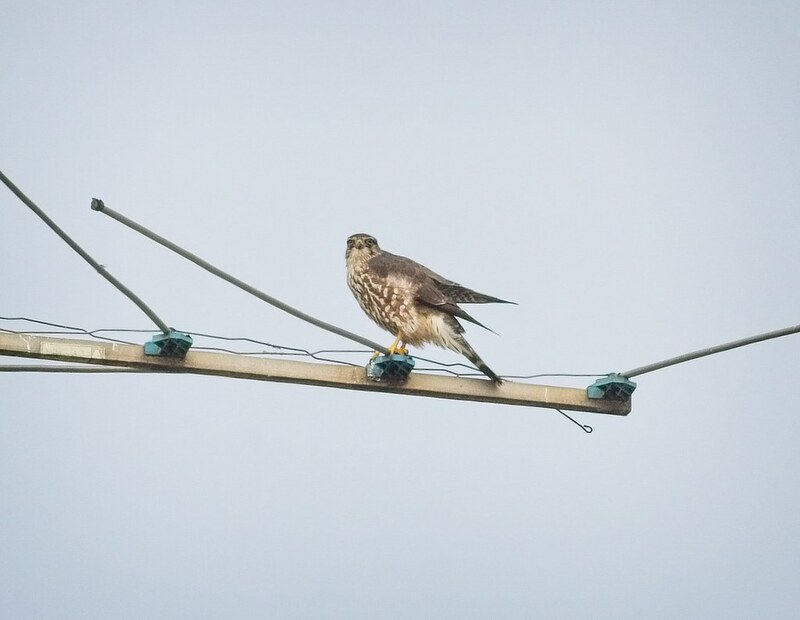 I'm most excited to report I've been seeing a Merlin fairly regularly along Avenue A. These small falcons go after sparrows and starlings, of which there are many in the area. I was lucky to catch this guy perched, as he flies so fast, he's gone in a flash. 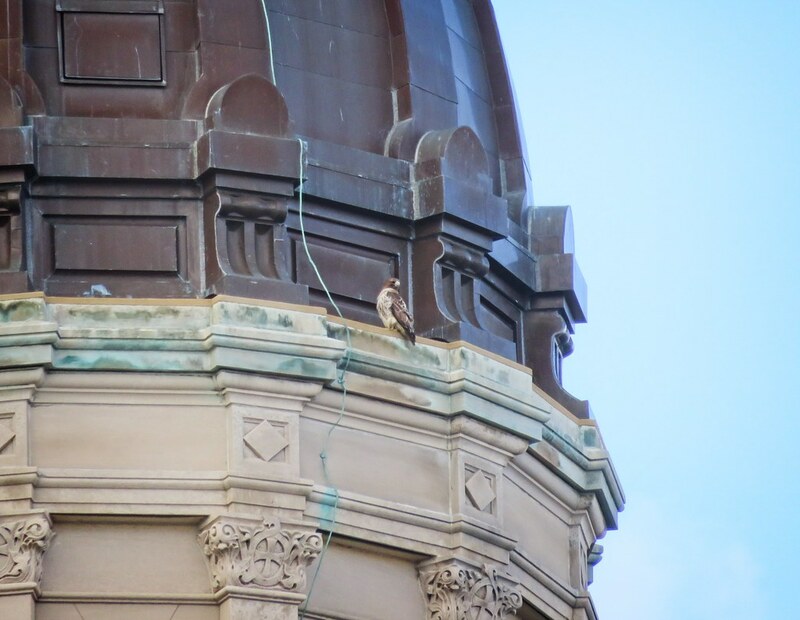 Meanwhile, January 6 marked a milestone as it was the first time I've seen Amelia perch on the base of the dome of Most Holy Redeemer Church. This was a regular perch for Dora, but I hadn't seen Amelia go up there until this day. Christo has been perched in this spot recently, so the next milestone will be seeing Christo and Amelia there together. 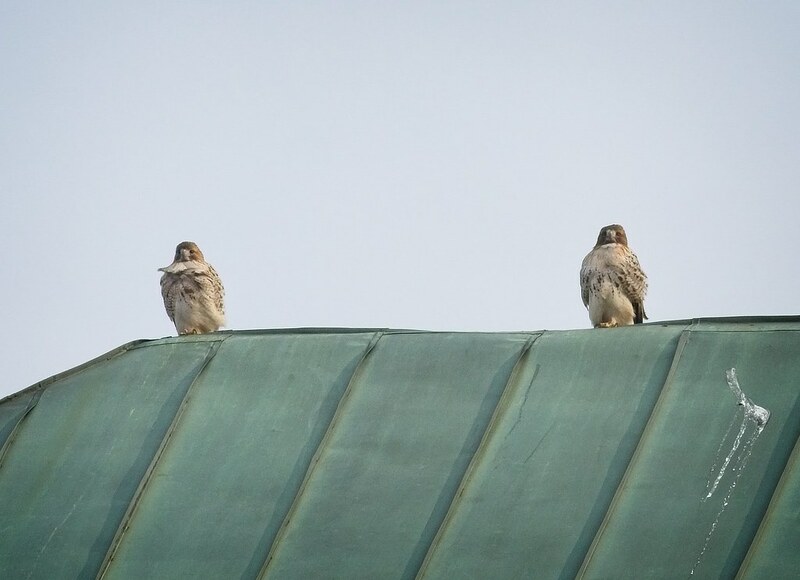 One place the hawks do like to perch together is on the roof of the Christodora House. Be sure to look up at the building on Avenue B and 9th Street and see if you can spot the two sentinels keeping watch over their territory. When Christo is not on guard duty, he spends leisure time in Tompkins Square watching basketball. 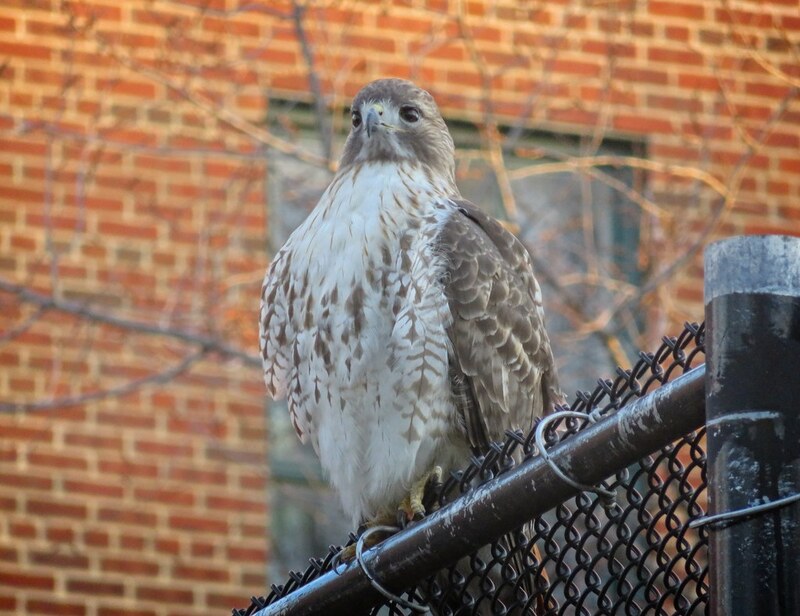 On Monday, just before sunset, I found him taking in a game by the handball courts (see video below). Ok, Christo is actually hunting along the fence and not really into the basketball game, but he's obviously so tolerant of human activity, he feels comfortable being so close to them. And I appreciated that the kids didn't interfere with his business although they knew he was there. It was really nice to see everyone coexisting peacefully.